Charitable giving is an important Canadian value and tradition. Every year, Canadians from coast to coast support the causes that matter to them. To support this worthy cause here is a form that can be printed and filled out and sent to us. 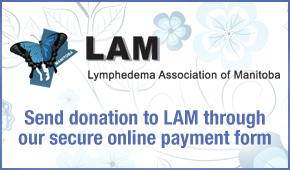 Additionally, donations can be sent online directly to the Lymphedema Association of Manitoba through our secure online payment form.